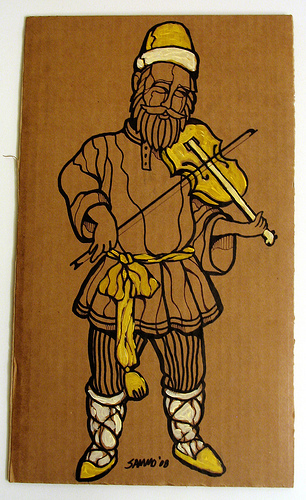 Recently I submitted a cardboard painting to the NOLA RISING Free Art Campaign. According to the NOLA RISING website: "NoLa Rising is a post-Katrina art campaign encouraging people in all faubourgs of Greater New Orleans to publicly display works of art, regardless of how simple or untutored it may seem to be, for the purpose of rebuilding and restoring the human spirit in our city. NOLA is a unique and beautiful city that has historically embraced the spirit of personal freedom that supports the growth of the artist, musician and writer ... the goal of the NoLa Rising Project is to showcase that spirit." 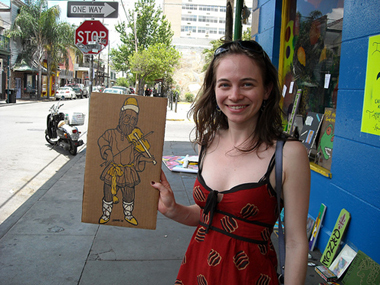 Many thanks to Rex Dingler for taking the photo of the woman who chose to take my painting home.